I haven't baked anything for awhile and I have been itching to have a go at making a carrot cake as its one of my favourites. Seeing the new Children in Need 'Baking Hero'fundraising campaign debut yesterday tipped me over the edge and I decided it was time I finally had a go. The CiN campaign features a number of celebrities heading up different cake teams.The idea is to pledge yourself to a team and encourage your friends and to do the same, bake your cakes following the celebrity recipes and hold a cake sale in aid of Children in Need. By joining your team's hashtag on Twitter you can track everyone's progress and offer support, pretty cool right? Of course I realised I haven't actually made a carrot cake before, so I needed to get some practice in first. I chose to follow the cake goddess that is Mary Berry's recipe in my copy of Mary Berry's Baking Bible which is always my first point of reference when baking anything new. Her recipe calls for walnuts but I omitted these as my family aren't big nut fans. One of my favourite aspects of Mary's recipes is that most of them use the all-in-one method, which means you put all of the ingredients in a mixing bowl and then beat until well mixed. I simply put my mixing bowl on top of my electric scales and measured in each ingredient one by one which is a real time saver. The next steps were just to pour into a greased cake tin and bake in the oven for around an hour. I used a spring-clasp tin with a loose bottom that I bought in the Next Christmas sale last year which is great as once the cake is baked I just unlatch the clasp and the tin springs off as the sides expand. 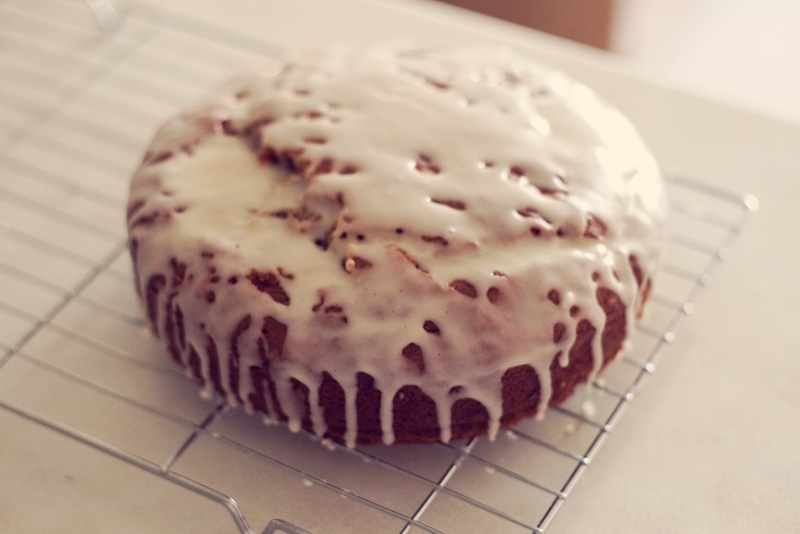 Instead of following the recipe for the cream cheese icing which is normally found on carrot cakes I made a vanilla glaze and drizzled it over the top. The main reason for that is that my boyfriend doesn't like cream cheese but also because the glaze was much quicker and easier to make than cream cheese buttercream and I was feeling a bit lazy! 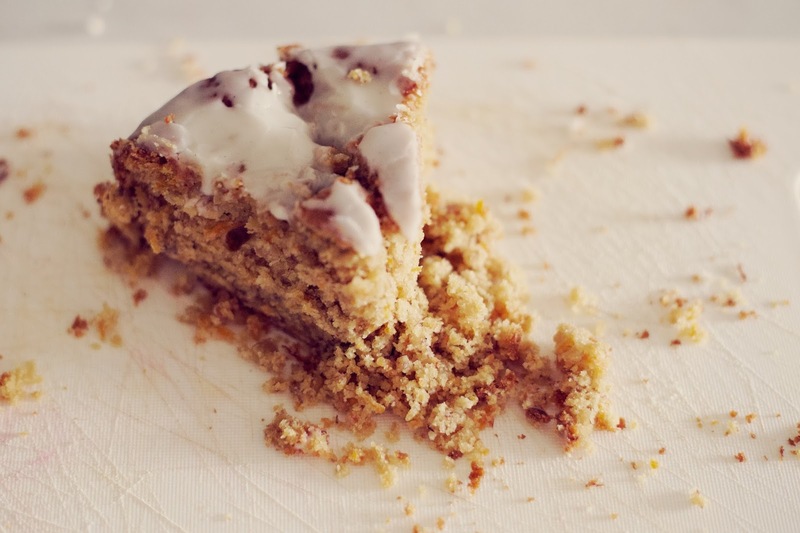 The glaze is made from madagascan vanilla extract (with seeds), icing sugar and milk. I intended to drizzle the cake gracefully, but due to an excess of icing it ended up pretty much covered! The cake itself was good for a first attempt I think! It has a sweet taste with a hint of banana (Mary's recipe called for two ripe bananas, which I assumed was for added moisture and sweetness to avoid adding more sugar) and of course carrot. 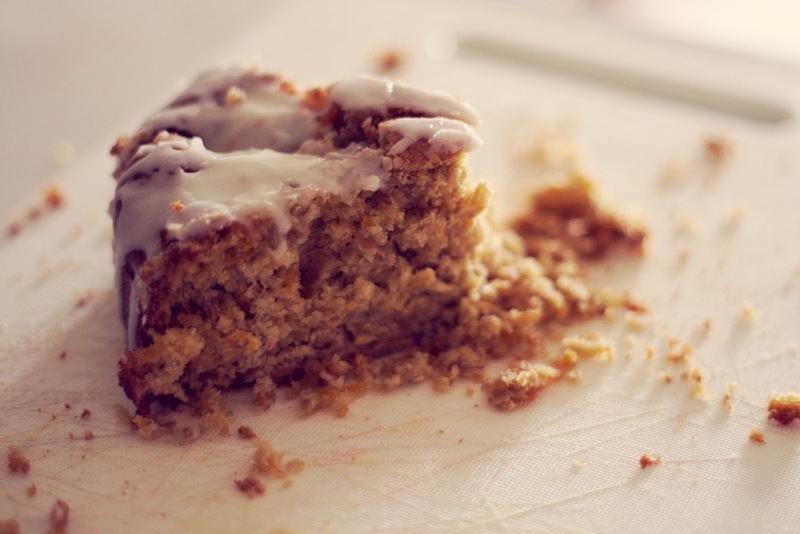 I found it a bit odd that the recipe didn't call for any cinnamon or ginger, as I prefer my carrot cake to be a bit more spiced whereas this tastes like a cross-between a carrot cake and a banana loaf. The cake could easily be eaten without any icing or glaze with a cup of tea but I think the added glaze is a nice touch. The cake would be very sweet and sickly with the addition of cream cheese buttercream in my opinion. Overall I am really pleased with the cake for a first try! Next time I think I will give John Whaite's (previous Great British Bake Off winner) recipe a go as I have just discovered it on the Children in Need website. His additions of raisins, mixed spice and orange and lemon zest sound delicious, and much more like my kind of carrot cake (sorry Mary!). Remember if you'd like to pledge yourself as a #BakingHero or find out more you can do so here. Let me know if you have had a go at baking carrot cake and if you have any tips! Which cake team will you be backing?